Click on the Tournament for the Round-Ups, including Scores, Recaps and More. The Hitmen from Morongo come in and take the championship in their first SCIFL appearance over Maccabi USA. The Hitmen won their second tournament in a row but it took them 11 innings to beat the Long Beach Wolfpack 1-0 in a great championship game. 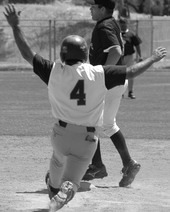 The Hitmen from Morongo take there third tournament in a row over Rude-Pac 4-0 in the final tournament of the season.